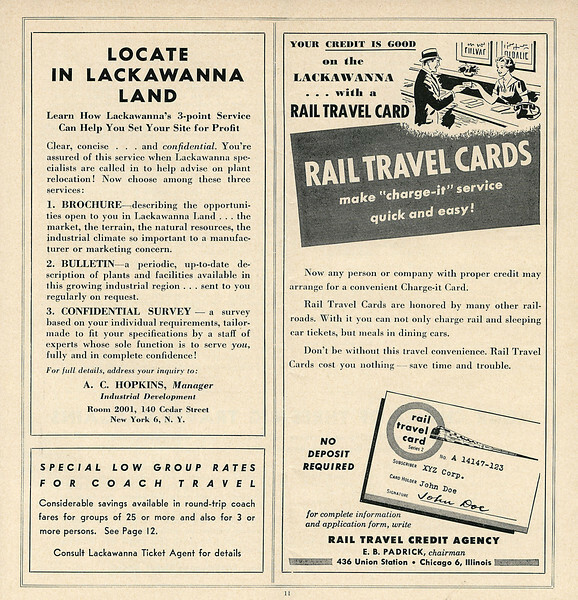 Compared to the Erie and Lehigh Valley the Delaware, Lackawanna & Western had invested heavily in re-equipping its fleet of trains after WW2. 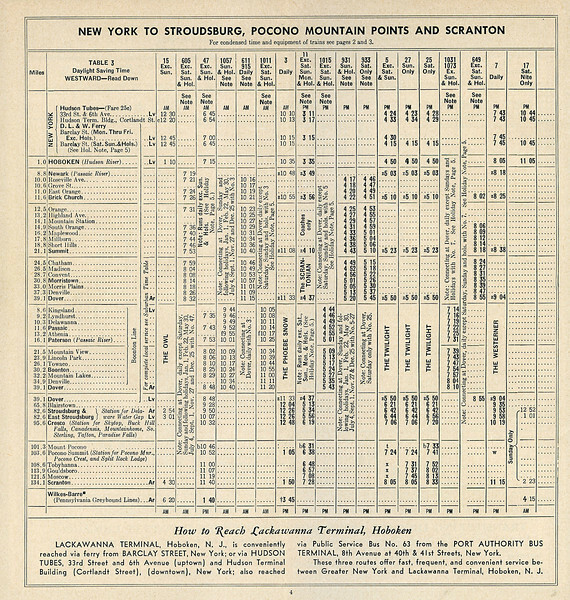 The Lackawanna was the shortest route between New York and Buffalo (396 miles), but because of the mountainous nature of much of the route it wasn't necessarily the fastest. 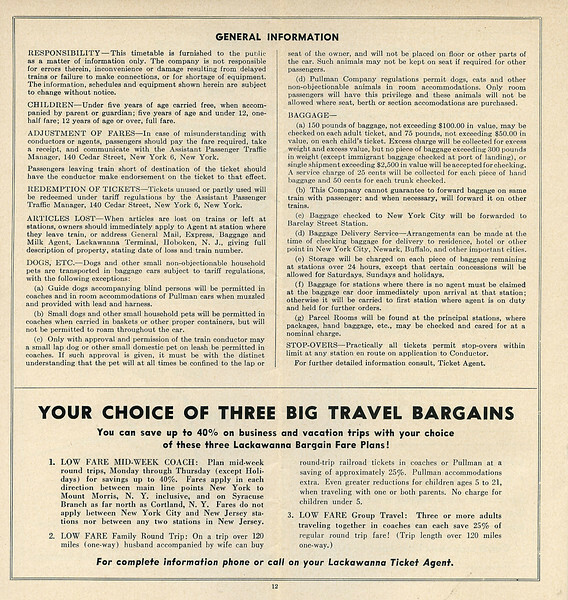 In 1958 the DLW still put a bold face on their passenger business, but losses were mounting, adding to the need to find a suitable merger partner. Unfortunately the most suitable candidate, the Nickel Plate Road wasn't interested, the Lackawanna's debts and loss making New Jersey commuter operation put them off. Instead, in 1960 the DLW and the Erie merged to form the Erie-Lackawanna, barely 10 years later they had exited the long distance passenger business, two years after that, as a consequence of damage caused by Hurricane Agnes, the E-L declared bankruptcy and four years later was subsumed into Conrail. Today little is left of the once mighty Road of Anthracite outside the New Jersey comuter operations and the mainline between Slateford Junction, Scranton and East Binghamton. 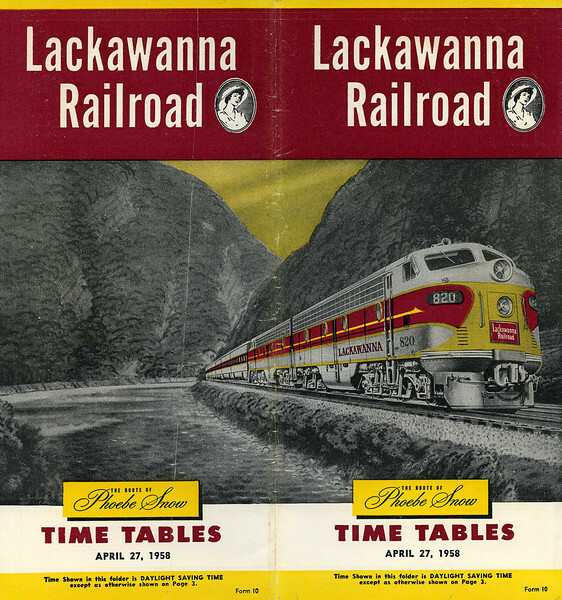 The cover features the Lackawanna's signature train, The Phoebe Snow, in the Delaware Water Gap. Phoebe Snow was an early work of advertising genius, created in the 1900s to extol the virtues of the clean burning anthracite Lackawanna locomotives used. 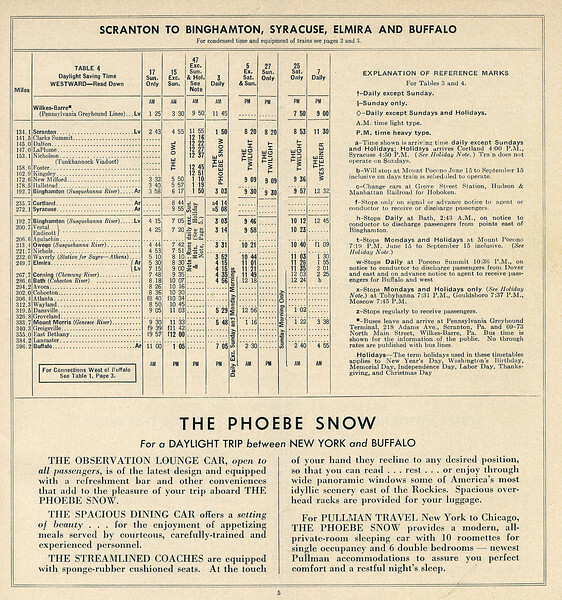 Pheobe was a young lady who habitually wore white and was extraordinarily partial to train travel, favouring the Lackawanna because of its use of anthracite. To ride the Road of Anthracite. During WW1 the Lackawanna was forced to burn bituminous coal as anthracite was needed for the war effort and Phoebe disappeared from view. She next appeared, in uniform, during WW2 on the side of boxcars and after the war as the new name for the streamlined version of the DLW's crack train, what had been the Lackawanna Limited. 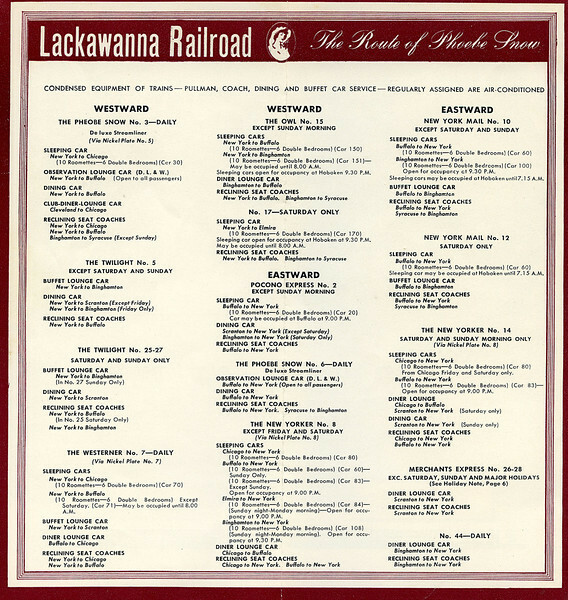 Apart from Phoebe Snow all Lackawanna trains had separate names eastbound and westbound. 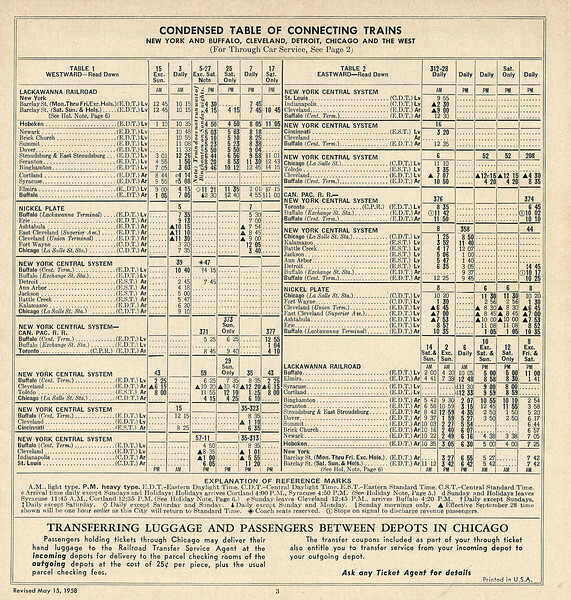 There were four through trains between Hoboken and Buffalo; Phoebe Snow and The Westerner both carried Chicago sleepers for interchange with the Nickel Plate Road. The Twilight was coaches only and arrived in Buffalo at 2:30 a.m, except Sunday when it terminated at Binghamton. 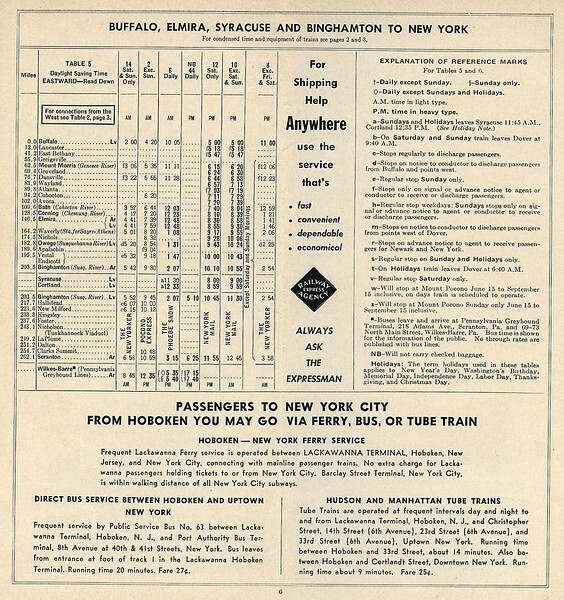 The other through train, the Owl (no.15) carried sleepers for Buffalo and Binghamton and ran daily except Sunday morning. The Sunday equivalent of the Owl, no.17 actually left on Saturday night and carried a sleeper for Elmira, the only day of the week Elmira had a dedicated sleeper. The Lackawanna's principal connection in Buffalo was with the Nickel Plate Road (New York Chicago & St Louis) which carried the sleepers off the Phoebe Snow and Westerner onward to Chicago. The Nickel Plate used the Lackawanna Terminal, other connections were available by changing stations. Table 3 which covers the mainline to Scranton also includes connecting commuter services between Dover and Hoboken by both the Mainline and the Boonton Line. Travelling on the Phoebe Snow is a very enticing prospect judging by this description. 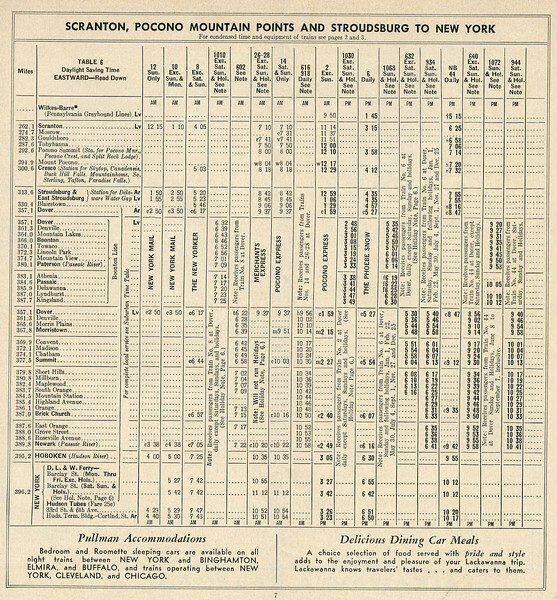 Table 6 covering eastbound services from Scranton to Hoboken includes no.26-28 The Merchants Express, an early morning Scranton to Hoboken train for those travelling to New York on business. It was one of the first DLW name trains to be withdrawn. 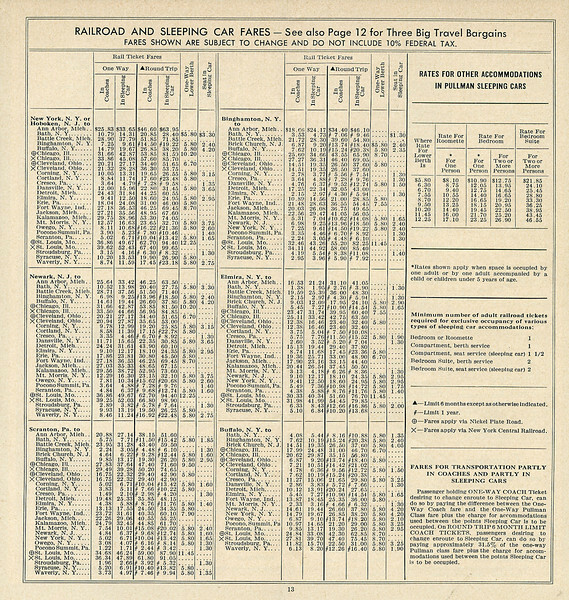 The Rail Travel Card was an early charge card, which could be used to buy rail tickets. Card holders were billed once a month and expected to pay the outstanding amount in full. The DLW promoted its catchment area to new business in an attempt to replace the income from anthracite. Fares, I paid $27 to travel from Philadelphia to Harrisburg last month. 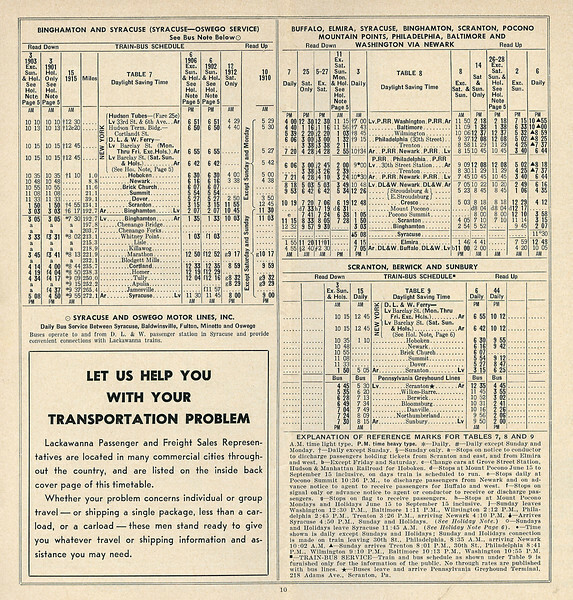 Back in 1958 $27 would have got me to Fort Wayne, Ind via the Nickel Plate connection at Buffalo, about seven times the distance! 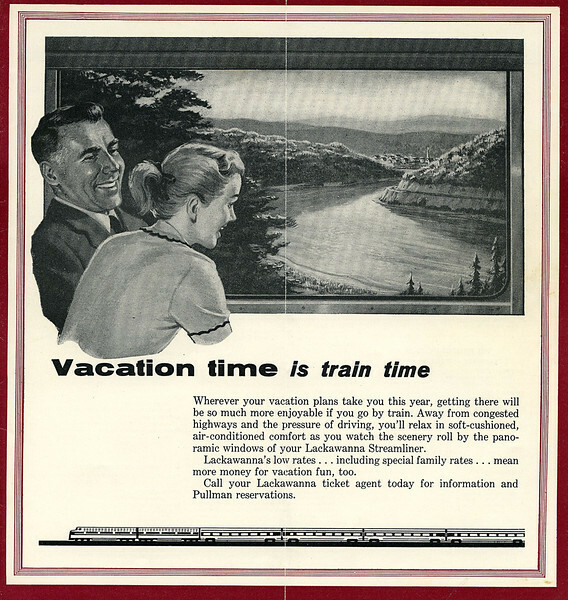 A middle aged dad and his daughter, at least that's what I think they are, enjoying travelling through the Delaware Water Gap on board a Lackawanna streamliner.